Edwin Ash of Richmond and Benjamin Burns of Blackheath published a letter in The Times suggesting that "those who play the rugby-type game should meet to form a code of practice as various clubs play to rules which differ from others, which makes the game difficult to play". On January 26, 1871 a meeting attended by representatives from 21 clubs was held in London at the Pall Mall restaurant and the RFU was formed. It should have been 22 founder members but the Wasps' representative "turned up at the wrong pub, on the wrong day, at the wrong time". In days of old the blazers hated nothing more than a player who had the gall to earn money, even if not directly from playing. 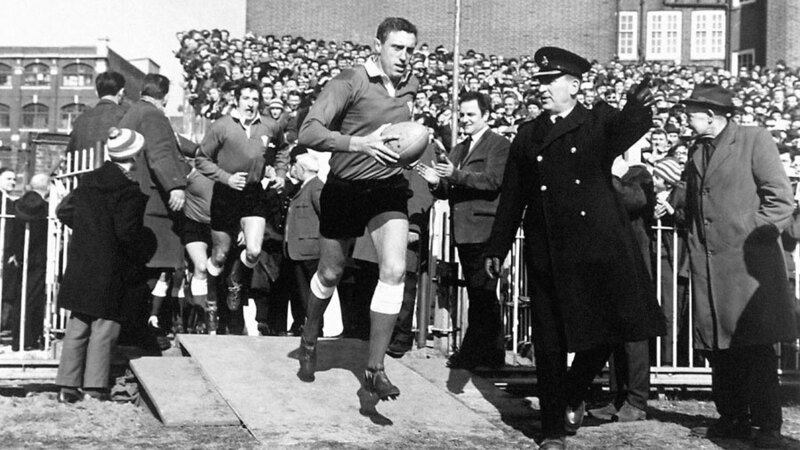 When former Wales captain Brian Price retired in 1969 because of a bad knee he thought that was that. But he returned in France in 1971 and started playing for Vichy. When the Wales board found out it treated him in the kind way to be expected at the time - it immediately contacted the French and demanded he be banned. His crime? He had accepted payment for a newspaper article written after his retirement. "I feel bitter," Price said. "If I could have seen into the future I would not have accepted the newspaper offer." In 1973 Price asked to be allowed to take up a coaching role with his club Newport. The blazers refused. Cardiff Arms Park was flooded after the River Taff burst its banks leaving the ground under 20 inches of water. A day earlier the ground had hosted Wales' Test loss to South Africa, which was threatened with abandonment when the quagmire engulfed the pitch markings and made it impossible to discern between the teams. A row at London Welsh when Aberavon touch-judge Meirion Prosser hit London Welsh forward Brian Evans across the head with his flag. "I was just warning Evans," Prosser said. "He was kicking one of our players." In the era when touch-judges were supplied by the clubs, the referee immediately sent Prosser to the stands. Tri-Nations champions South Africa completed their season with a win over a depleted Argentina side in Buenos Aires. The South Africans ran out 39-7 winners, with Gaffie du Toit scoring two tries. Marius Joubert, Fourie Du Preez and Jacques Cronjé also scoring while Du Toit converted four and added two penalties. South Africa were never in trouble against the Pumas, leading 36-7 at the break with the home side's only score coming from a try on the stroke of half-time from Pablo Bouza. SANZAR announced that a number of experimental laws would be trialled in the 2008 Super 14 competition. At the request of the IRB, it agreed to adopt the changes in order to simplify the game, keep the ball in play longer and create "a more free-flowing, faster and exciting style of play". Changes included requiring each backline to be five metres from the hindmost foot at the scrum; not allowing a ball that has been passed inside the 22m line to be kicked out on the full; modification of the tackled ball rules and the implementation of free kicks rather than penalties for most non-serious offences. The Second Springboks completed the Irish leg of their tour with a 19-0 victory against Ulster in Belfast. It meant that the tourists had scored a staggering 57 points in Ireland without conceding a score. St Mary's Hospital, fast becoming one of the best war-time sides in the country, defeated Birmingham University 15-3 at Teddington. The medics' midfield triangle of future England caps Keith Scott, Norman Bennett and "Nim" Hall (who dropped a clever goal) tore the University defence to shreds. Welsh preparations for the Five Nations were thrown into chaos when the 'Probables' were unexpectedly but comprehensively defeated 19-3 in the second Welsh Trial, at Abertillery.